Modern curio display cabinet brings an element not normally seen in a curio: An abundance of concealed storage space. Onlookers will see the Jamison as just beautiful, minimalistic curio display. 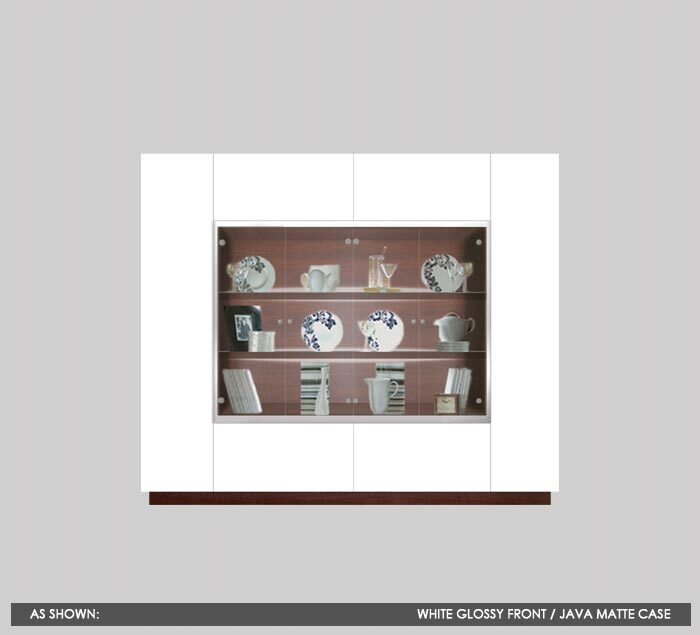 Glass doors, glass shelves and interior lighting, framed with a wood or colored glass finish. A closer examination reveals full height cabinet doors on each side, a pair of oversize drawers below and a couple of upward opening doors above the central display area. The Jamison is completely free standing, meaning it does not get attached to floors or walls. The cube bookshelf layout creates an elegant nine-compartment display for your literature collection which can also be complemented by any combination of assorted decorations. The finished faux back will allow this piece to "float" in the center of a room, acting as a room divider or freestanding partition. The Harrison Bookshelf features two top storage spaces with pneumatic flip-up doors above the center display area for additional light storage. Beneath the display cavity lie two oversized utility drawers with full extension ball bearing drawer slides for easy access. Both the left and right sides of the unit feature full-sized cabinets with four wood shelves each, perfect for books, picture albums or any other accessories you may wish to keep accessible yet not visible. This piece is available with in-home delivery and installation. Our trained professionals will deliver, unwrap and appropriately place your unit in the desired location as instructed by the customer. Though the piece will appear built in, it is entirely freestanding, meaning it can be moved whenever and wherever the owner wants. After completing the installation, packing materials will be removed and returned to our factory for recycling. You just have to supply the books!